Calla Lily Crystal Blush are a small headed variety with a thin stem. Flower head sizes only vary slightly between different stem lengths. The Calla Lily is a truly unique and elegant flower. Their shape is like no other and are available in a huge range of colours & stem lengths. Calla lilies are grown from bulbous roots called tubers and are known under a variety of different names such as Pig Lilies, Calla Lilies, Arum Lilies, Trumpet Lilies and Zantedeschia. Calla lilies are not really lilies – they are part of the zantedeschia genus and originate from South Africa. 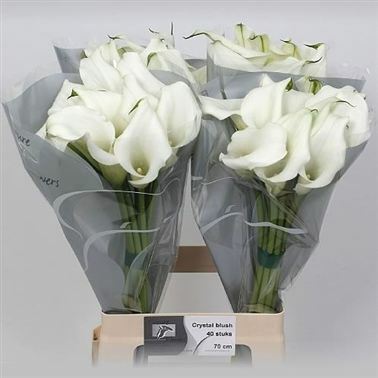 Calla Lilies are grown commercially under glass and are available on the wholesale flower markets between February and the end of August.